Citigroup (C) Chief Executive Vikram Pandit told a congressional oversight panel Thursday that the bank -- still 27% taxpayer-owned -- is on a "very strong foundation" and is positioned to contribute to the economic recovery. The CEO added that he supports federal regulatory reform that would protect consumers. Citi is now among the best-capitalized banks in the world and deploys far less leverage, Pandit said in testimony before the panel of outsiders overseeing the Treasury Department's Troubled Asset Relief Program (TARP). Citi has also cut the size of its balance sheet by half a trillion dollars, or 21%, from peak levels in the third quarter of 2007, and it substantially reduced its exposure to risky assets, Pandit said. Citi still owes the federal government $25 billion after paying back $20 billion in December. "Citi is now a smaller institution that is focused on being a bank, not a financial supermarket," Pandit told the panel Thursday. "We have developed a culture of responsible finance, including through a different approach to risk management, asset liability management and risk return." The CEO also called for greater consumer protection at the federal regulatory level, despite the possibility of "a significant cost impact" on the financial services industry because it "would lead to a healthier, more stable system." Pandit said uniform national standards should apply to all market participants that provide financial products to consumers. He also recommended transparency in disclosures so that financial product language is simple and understandable, among other changes. Financial regulatory reform has thus far been stymied by lack of bipartisan support in the Senate. However, top senators from both parties appeared closer to breaking a logjam on broader financial regulatory overhaul earlier this week after agreeing to the creation of a new consumer-protection division within the Federal Reserve. The new entity would have autonomous power to write regulations governing everything from credit cards and overdraft fees to payday loans and mortgages. 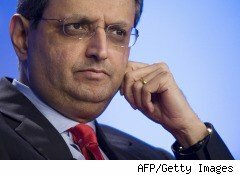 Unlike many other financial institution executives who rankled under TARP, Pandit thanked American taxpayers for their largesse, noting that the Treasury has earned $3 billion in dividends and interest from Citi on the bailout funds as well as $5.3 billion in premiums from the bank on the asset-guarantee program that Citi has since exited. Pandit also stressed that Citi is solvent and won't need more TARP funds.